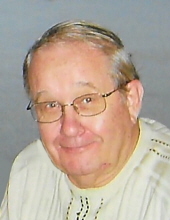 WILLIAM M. ROCH “BILL” age 81, passed away Saturday, March 23, 2019. Beloved husband of Linda (nee Carkhuff); loving father of Rachelle Shanahan (Richard), Michael (Melissa) and Kevin; dear stepfather of Angela (Keith), Gerri (David), Kimberly (Eric), Joanna (Matthew) and Nicole (Allan); cherished grandfather of Faith, Lily and step-grandfather and step great-grandfather of many; dearest brother of Jack, Tom, Kathy Barrish and the following deceased: Eddie, Lynn and Bobby; devoted son of Evelyn and Ludvik Roch (both deceased). Friends may call at THE KOLODIY-LAZUTA FUNERAL HOME, 5677 STATE RD., PARMA, WEDNESDAY 4-7 P.M. Mass of Christian Burial Thursday, March 28 at St. Anthony of Padua Catholic Church, 6750 State Rd., Parma, at 10 a.m. (PLEASE MEET AT CHURCH). Inurnment (at a later date) All Saints Cemetery. To send flowers or a remembrance gift to the family of William M. Roch, please visit our Tribute Store. "Email Address" would like to share the life celebration of William M. Roch. Click on the "link" to go to share a favorite memory or leave a condolence message for the family.